We recommend that you expose our Super Glow Spinner Blades to direct sunlight for 10 minutes to maximize hours of glow time. (99) Super Glow Assortment Pack contains an assortment 25 super glow blades. 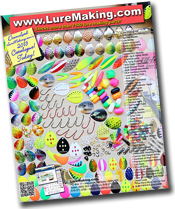 Includes Super Glow Tiger, Super Glow Baitfish. Super Glow Dot, and Super Glow one color.